I realize how corny this may seem, but the picture here represents my view of finances. Sure, it is not all encompassing. And I realize that my graphic design skills are a bit lackluster, but as I was coming up with this “map”, I realized how easy this makes explaining a big financial picture. Simply put, this is your income. The stream is what contributes to all aspects of your finances. Money enters and exits your stream frequently. You’ve got bills to pay, they come from your stream. You have things to buy…again the stream. You get the idea. Sometimes your stream is very small, and all of the other bodies of water feel strain. Other times (not frequently enough), your stream flows freely, with little or no twists, turns or dams. Keeping your stream strong and plentiful will make all of the other bodies of water surrounding it full and bountiful. Some people have multiple income streams. If this is the case, they usually intersect in one bank account or pocket, so for all intents and purposes, one stream illustrating all income works for me. There are multiple side income projects most of us have. It could be any number of things. The puddles are what I usually call “fun money”. This comes from a small side business (usually done for fun), online endeavors like surveys, a blog that brings in a small side income, or any other actions that yield a tiny prize. I usually use this money for stupid guilty pleasures or end up combining it with my stream to take care of some needs. Since the puddles usually do not end up being much (for me they are often less than $50), I do not feel guilt using them to indulge myself with things I would not normally spend money on. 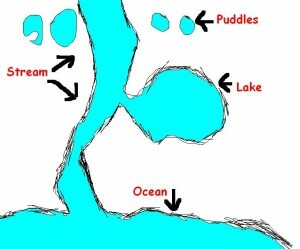 The funny thing about the puddles are that for some people, they grow and grow until they create a stream of their own. Who wouldn’t want that? Here is where the savings lie. Your stream (hopefully), feeds the lake regularly. Have an emergency account, and savings for anything you are looking forward to. Lakes fill and evaporate, but they are a necessary part of your financial well-being. I have written a few times before about where you can keep many “lakes” with no minimum for free, so find a place to stash your funds that will not eat at the shoreline of your lake. You will eventually want to settle down, retire, and start yelling at kids to get off your yard. In order to do this comfortably, you will have to have an ocean of money to feed you well into your early hundreds. For most of your working lifetime, your stream will be getting pulled every which way. There will be major purchases, life events, and even some catastrophes that will greatly affect your stream. Even with everything that goes on through the bulk of your lifetime, retirement should always be in the back of your mind. Keep filling your ocean, and you will be happy you did when it comes time to enjoy every waking moment and bask in the glow of the Florida sunshine in your gated senior community. As I said in the intro, the water map is not all knowing, and all seeing. But it does provide an interesting and easy to explain illustration of how one’s financial picture looks. Sure, everyone’s waters are at different levels and sizes vary greatly, but I hope that you can use this to explain finances to others…and perhaps help them get a better idea of how to use money wisely for the needs and wants of life. I appreciate your creativity and compelling visual aids (also the witty humor)! Thanks! Wit and humor are different…fortunately, I have both. Oh, and ego…I’ve got that too! I like it – reminds me of Robert Allen’s “Multiple Streams of Income” but this is a better all-around picture. Next post: Why Would You Spend That?